For almost a decade, cranes stood above a half-built house on the beach at Bettystown, Co Meath. The house remained little more than a shell for years, and the unfinished structure was exposed to elements and sometimes vandalised. 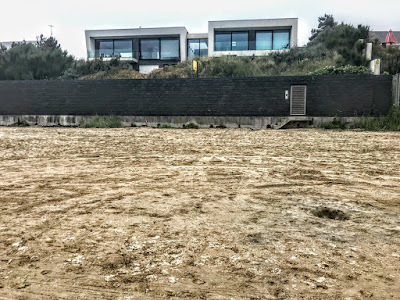 But now the beachfront Beach Haus is a family home, and it has come on the market in recent weeks with an asking price of €1.25 million. The name of the Beach Haus is a reminder that this house is built in the Bauhaus style. Staatliches Bauhaus, known simply as Bauhaus, was a German art school from 1919 to 1933 that combined crafts and the fine arts, and was famous for the approach to design that it publicised and taught. The Bauhaus was founded by the German architect Walter Gropius in Weimar. The German term Bauhaus (‘building house’) was understood to mean ‘School of Building,’ although the school was sought to bring together all arts, including architecture. The Bauhaus style became one of the most influential currents in modern design, Modernist architecture and art, design and architectural education. It had a profound influence on later developments in art, architecture, graphic design, interior design, industrial design, and typography. 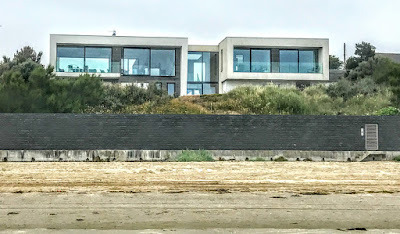 The Beach Haus in Bettystown has tell-tale elements of the Bauhaus approaches to design in the rectilinear boxy construction and the huge emphasis on expanses of glass. Like Bauhaus, this house is a great example of how functionality need not be boring. And this house is anything but boring. The Beach Haus was designed by the New Zealand architect Craig Bradford. The property includes a three-bedroom guest house and two-bedroom apartment, both unfinished and amalgamated into the main house. The house is built in a very unique contemporary style on three levels. At all three levels there is access to the terraces and large balconies overlooking the sea, and there are stunning vistas from all principal rooms. The two sea-facing bedrooms have balconies, while the two to the rear have terraces overlooking an internal courtyard. The German engineered anodised aluminium triple glazed windows are the largest domestic installation in Ireland. These floor-to-ceiling windows in all rooms complement the artisan-crafted Italian marble and mother of pearl terrazzo flooring in all rooms. The floors once lay hidden under years of detritus, but have been freshly polished, reflecting the vast swathes of light throughout the house, and they are heated underfoot. There are floor-to-ceiling custom walnut doors with frosted glass and modern Dornbracht/Hans Grohe German hardware. In the central foyer – which provides access to the guest house – a floating cantilevered staircase was so cumbersome that it had to be poured on site and the glass balustrade was so large it required bullet-proof glass. The original plans included a gym, a sauna and a wine cellar in the basement, which is now used as storage. The house was also wired for an electric grand piano. The house goes down 3 metres on the beach side, and the amount of concrete used could support a building four times its size. Inside, the house has motorised blinds, zoned LED lighting and a Sonos audio system. The 10-ft high ceilings have acoustic panelling to ensure sound-proofing. Cedar was used as external cladding and for the interior walls. One entire wall inside has a hidden panel for the 65-inch television screen. Cedar was also used on the four-car double garage inside the electric gates. 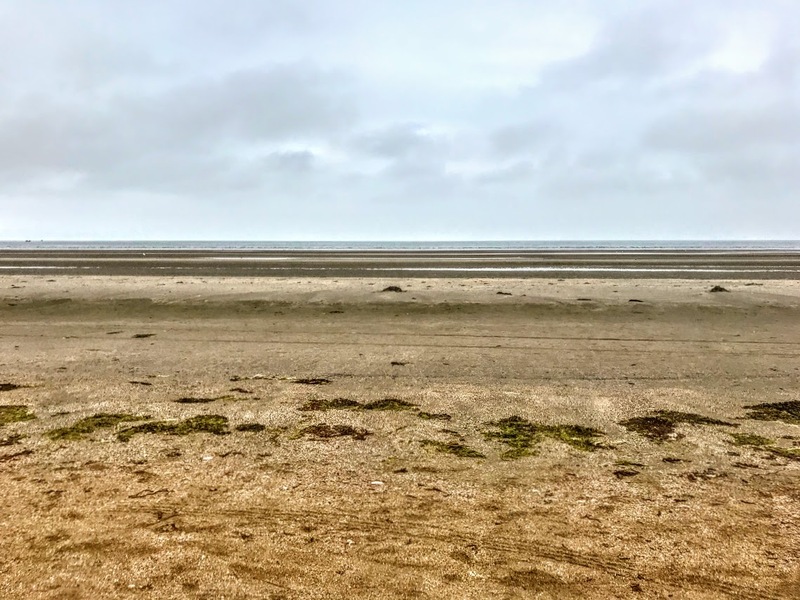 Bettystown Beach is at the backyard, and a door with keypads at the end of the garden wall gives the residents direct access to the beach. The perimeter walls are built of solid stone blocks that are cemented several metres below to ensure they withstand the elements. The house stands on a site of 0.20 hectare (0.5 acre), and the landscaping around the house includes year-round flowering foliage, newly-planted trees, shrubberies, sun-trap patio areas and water features. The house is 16 km from the Dublin-Belfast M1 motorway and has panoramic views over the Irish Sea, the Mourne Mountains and as far south as Skerries in north Co Dublin. Bettystown is about 50 km north of Dublin, 35 km from Dublin Airport and 8 km south of Drogheda which is Ireland’s largest town. The Beach Haus is on the market through Savills Country, 20 Dawson Street, Dublin 2, with an asking price of €1.25 million. I was in Dublin from early yesterday [11 July 2018] for meetings with politicians and government officials in Leinster House, Kildare Street and Buswell’s Hotel to discuss some matters of concern in Rathkeale. As I have another hospital procedure this morning, I stayed overnight rather than returning to Co Limerick, and watched the England v Croatia match at home. 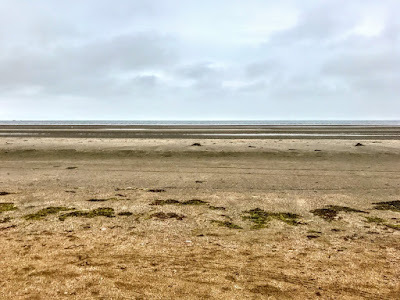 But in between those meetings and that match, two of us spent the afternoon in Laytown and Bettystown on the coast of Co Meath, walking the long stretch of sandy beach, and meeting another long-standing friend now living in Julainmstown for a late lunch in Relish Café in Bettystown. It must be about three months since I was last in Bettystown and Laytown. So, it was wonderful to have an afternoon walk on this beach, despite the fact that the long stretch of summer weather we have been enjoying since returning from Crete last month seems to have been interrupted – at least for the next few days. We had decided to park the car at Laytown and walk to Bettystown, but work on an interesting project on building much-needed sea defences to shore up the sandy banks at Laytown made it a little confusing initially as we made our way down onto the beach. 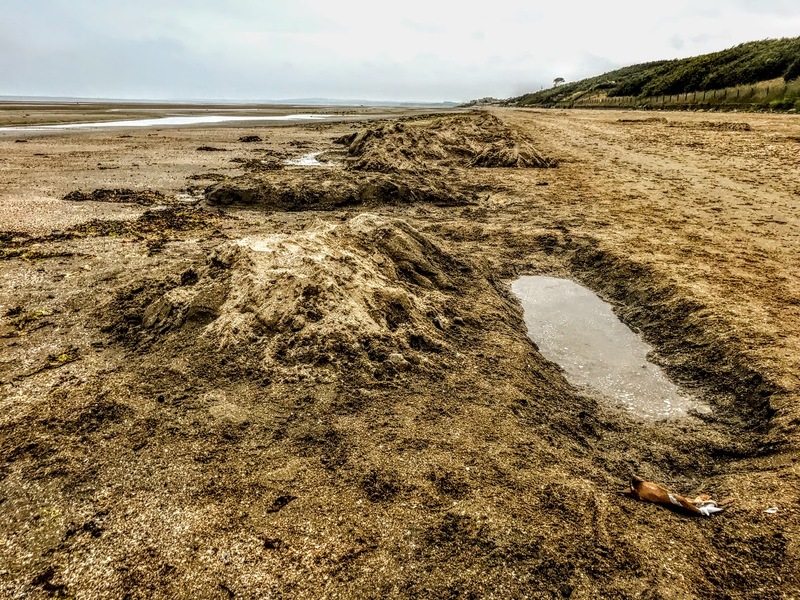 Perhaps if Meath County Council is intent on protecting the sand banks and this long stretch of beach, they could also introduce measures to stop people driving their cars onto to sand, a move that would go along way towards restoring this as an attractive beach for walkers and bathers. 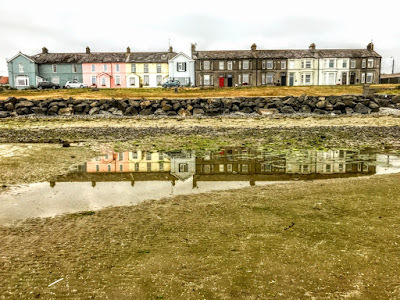 The tide was out, adding to sense of a parched landscape that all of us are noting in this spell of dry weather – despite some short rain showers at intervals yesterday. 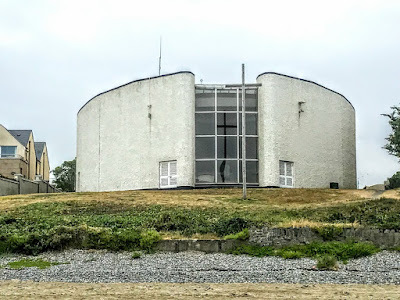 As we walked along the beach in the late afternoon, I noticed an unusual reflection of the cross on the sandbank on the full-height east windows of the church in Laytown. Below the sand banks, there are still visible traces of entries in the 16th National Sandcastle and Sculpturing Competitions, which took place on the Bettystown-Laytown Beach last Sunday afternoon [8 July 2018]. There were signs of the inevitable castle or octopus, and the occasional fish or mermaid. A crocodile seems to have survived the waves and tides of the days that followed, and one imaginative map of Africa is still leaving its mark on the sand. But where the sea has worked its way steadily in the ebb and flow against those creative imaginations, some of the rows of allocated lots look like a moonscape. The tide was still out as we walked back from Bettystown to Laytown after lunch in Relish, and a number of trawlers seemed to be closer to the shore than the distant horizon. Although the skies were dull greys rather than the bright blues of summer, we could see as far as the towers at Mornington. Yet it seemed to be a sad insight into the inevitable reality that the days are already beginning to shorten, and sooner than we expect we will begin to notice that the evenings are beginning to close in.